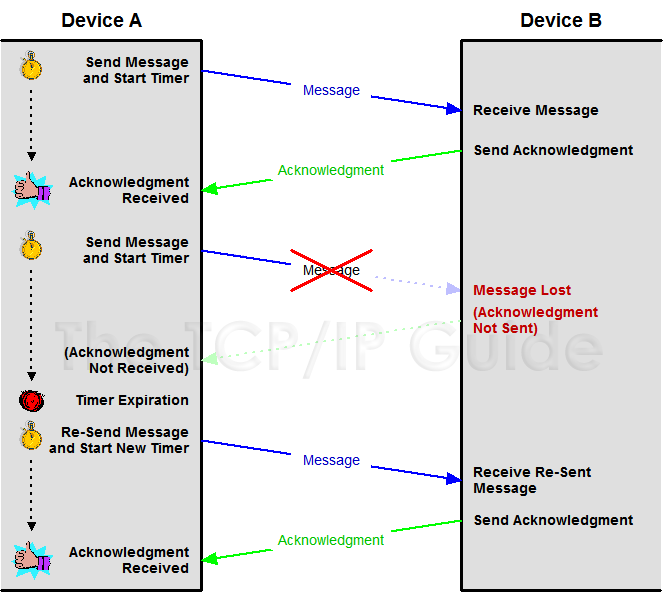 Basic reliability in a protocol running over an unreliable protocol like IP can be implemented by closing the loop so the recipient provides feedback to the sender. This is most easily done with a simple acknowledgment system. Device A sends a piece of data to Device B. Device B, receiving the data, sends back an acknowledgment saying, Device A, I received your message. Device A then knows its transmission was successful. Of course, since IP is unreliable, that message may in fact never get to where it is going. Device A will sit waiting for the acknowledgment and never receive it. Conversely, it is also possible that Device B gets the message from Device A, but the acknowledgment itself vanishes somehow. In either case, we don't want Device A to sit forever waiting for an acknowledgment that is never going to ever arrive. To prevent this from happening, Device A starts a timer when it first sends the message to Device B, which allows sufficient time for the message to get to B and the acknowledgment to travel back, plus some reasonable time to allow for possible delays. If the timer expires before the acknowledgment is received, A assumes there was a problem and retransmits its original message. Since this method involves positive acknowledgments (yes, I got your message) and a facility for retransmission when needed, it is commonly called (ta-da!) positive acknowledgment with retransmission (PAR), as shown in Figure 204. This diagram shows one of the most common simple techniques for ensuring reliability. Each time a message is sent by Device A, it starts a timer. Device B sends an acknowledgment back to A when it receives a message so A know it was successfully transmitted. If a message is lost, the timer goes off and A retransmits the data. Note that only one message can be outstanding at any time, making this system rather slow. Key Concept: A basic technique for ensuring reliability in communications uses a rule that requires a device to send back an acknowledgment each time it successfully receives a transmission. If a transmission is not acknowledged after a period of time, it is retransmitted by its sender. This system is called positive acknowledgment with retransmission (PAR). One drawback with this basic scheme is that the transmitter cannot send a second message until the first has been acknowledged.